What Is Debt-Service Coverage Ratio or DSCR? As an entrepreneur, access to funds when you need it most is critical to the success of your business. That’s why it’s important to understand everything you’ll need to improve your chances of being approved for a small business loan. And one of the most important of those things to understand is debt-service coverage ratio, a critical factor which lenders use to determine if they’ll approve you for a loan. Below, we’ll break down what debt-service coverage ratio is, why it’s important, and how to calculate your own debt-service coverage ratio so you can get a better idea of where you stand in the eyes of lenders. The Debt-service coverage ratio, also known simply as DSCR for short, is a measure of how much cash flow your business has available to pay its debt. Debt can include payments towards interest, principle, and even lease payments. In the simplest terms, it’s a benchmark used by banks and other lenders to gauge how capable a company is at producing the cash necessary to pay what it owes. Lenders use the DSCR in addition to reviewing your profit and Loss statement and Balance sheet. For a lender who’s looking to calculate how likely you will be to pay back a loan (and how much you can pay back), the DSCR calculation is an important number. As touched on above, The DSCR calculation is important because it’s one of several factors that banks and other lenders use to determine both your loan affordability and eligibility when reviewing an application for small business loan or other type of funding. When you submit an application to a lender, it’s their job to review your information to determine your ability to pay back a loan. And, if your financials are in order, how much you may be able to pay back including interest. Preferably, lenders want to see that you’re in good standing across the board, with more than enough cash flow to pay your debt and then some. As a business owner, you know that things come up, so you need more just the bare minimum to ensure that you can pay whatever unexpected expenses arise in addition to a loan. For this reason, when lenders review your reports, they’re looking to see just how much extra cash you have when compared to your recurring debt obligation. What is an ideal debt-service coverage ratio? The higher your DSCR number, the better. Specifically, a DSCR of 1 or greater means your business has enough cash flow to pay for its debt obligations. However, it’s important to understand that lenders will have their own minimum DSCR requirements for loan approval. And, based on what we just talked about, simply having enough to pay your debt isn’t enough. For reference, a DSCR of .9 means a business has enough cash flow to pay for 90% of its expenses, while a DSCR of 1.2 means it has enough income to pay for all its debt plus 20% additional cushion. Generally, lenders are looking for a DSCR of 1.25-1.35 or higher. However, depending on the lender, they may accept a debt-service coverage ratio of 1.15 or lower. In general, it’s important to try and get your DSCR as high as possible before applying for a loan. However, you’ll first want to calculate your DSCR to see where you’re at. So, what is the debt service ratio calculation? However, it’s important to understand that there are a few ways to do this and which one a lender uses is ultimately up to them. 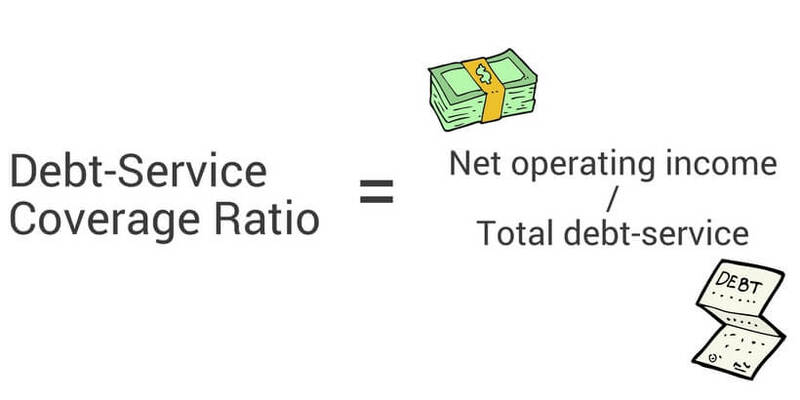 Net operating income is the first thing you need to calculate, which is a company’s revenue minus operating expenses (this doesn’t include taxes and interest payments). For a quick reference, net operating income is often considered the same as EBIT or ‘earnings before interest and tax’. Total debt-service (or TBS) is your current debt obligation, which includes any interest, principal, and lease payments due over the current year. Now that we’ve covered a basic calculation method for DSCR, let’s plug that into an example so you can see it in action. If you have a net operating income of $500,000 and your debt service is $400,000, your DSCR would be 1.25. That’s looking pretty good if you’re applying for a $50,000 loan as that would bring your DSCR to 1.1 after factoring in the loan. If you have a net operating income of $750,000 and a debt service of $670,000, your DSCR would be 1.1. That means your DSCR would barely be above 1 if you factored in the same $50,000 loan. Not bad as you’d still have the cash to pay off your total debt including the loan (on paper, at least), however, that’s not within the range of what lenders typically look for. It might sound like a lot of work to maintain a healthy DSCR, however, when you look at it closely, a healthy DSCR is just the sign of a healthy business. If you know your DSCR and seek to maintain it above 1.25+, you’re not just ensuring you’ll be more likely to be approved for a loan when your business needs it, you’re making sure your business will be able to handle any unexpected expenses that arise along the way. So, take the time to calculate your DSCR, whether you’re looking to apply for a business line of credit or business loan in the near future or not. If you do, you’ll be in a better position to handle whatever may come. How to calculate the Debt Service Coverage Ratio is critical to running a business that’s a fine tuned machine. However we understand that formulating the DSCR calculation manually is annoying so we put together a few templates.